Using their own fully equipped support craft, ‘PLA Diver’, they are in demand for many different tasks, including investigating underwater obstacles and potential archaeological items, and surveying underwater operational structures such as jetties and navigational aids. In support of the PLA’s own operations, the divers are involved in salvage work, clearing fouled propellers, maintenance of tide gauges, inspection of lock gates, sluices and flood barriers, as well as helping in the removal of old jetty structures. They also carry out damage inspection of vessels, searching for lost propellers and other items lost overboard, and slinging yachts ready for loading onto ships. As part of the PLA Marine Services team, the divers are available for third-party work in any part of the tidal Thames within the jurisdiction of the PLA, when not carrying out their routine duties. Click below to view a short film about the work of the PLA's Diving Service. 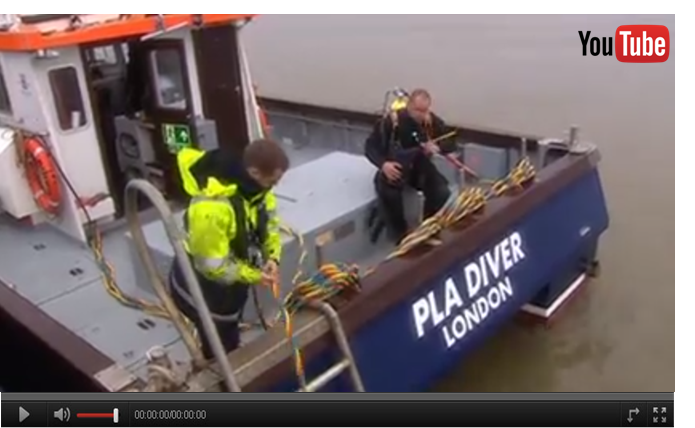 Click here to view our film about Working as a Diver in the Tidal Thames (opens in a new window).